The global data center chip market was valued at $7,718.9 million in 2017, and is projected to reach $15,641.1 million by 2025, registering a CAGR of 9.4% from 2018 to 2025. North America was the highest contributor to the global market, with $2,933.2 million in 2017, and is estimated to reach $5,474.4 million by 2025, registering a CAGR of 8.3% during forecast period. A data center is a premise of networked computers and storage that organizations from various fields use to organize, process, store, and disseminate massive amounts of data. A business usually depends heavily on the applications, services, and data contained within a data center, making it the point of focus and a vital asset for day-to-day activities. The data center chip is usually found in the server area within a data center and is one of the vital requirements in the premises. The global data center chip market growth is driven by in cloud computing and advancements in chip technology. In addition, government regulations regarding localization of data centers fuel the market growth. However, high data center operations impede the market growth. Furthermore, increase in smart computing devices is expected to present enormous opportunities for the market in the coming years. The key players profiled in the report include Intel Corporation, GlobalFoundries, Advanced Micro Devices Inc., Taiwan Semiconductor Manufacturing Co. Ltd., Samsung Electronics Co. Ltd., Arm Limited (SoftBank Group Corp.), Broadcom, Xilinx, Inc., Huawei Technologies Co. Ltd. and Nvidia Corporation. These key players have adopted strategies such as product portfolio expansion, mergers & acquisitions, agreements, geographical expansion, and collaborations to increase their data center chip market share. The data center chip market size is segmented based on chip type, data center size, industry vertical, and region. Based on chip type, the market is divided into GPU, ASIC, FPGA, CPU and others. Based on data center size, the market is categorized into small & medium size and large size. Based on industry vertical, the market is classified into BFSI, manufacturing, government, IT & telecom, retail, transportation, energy & utilities and others. 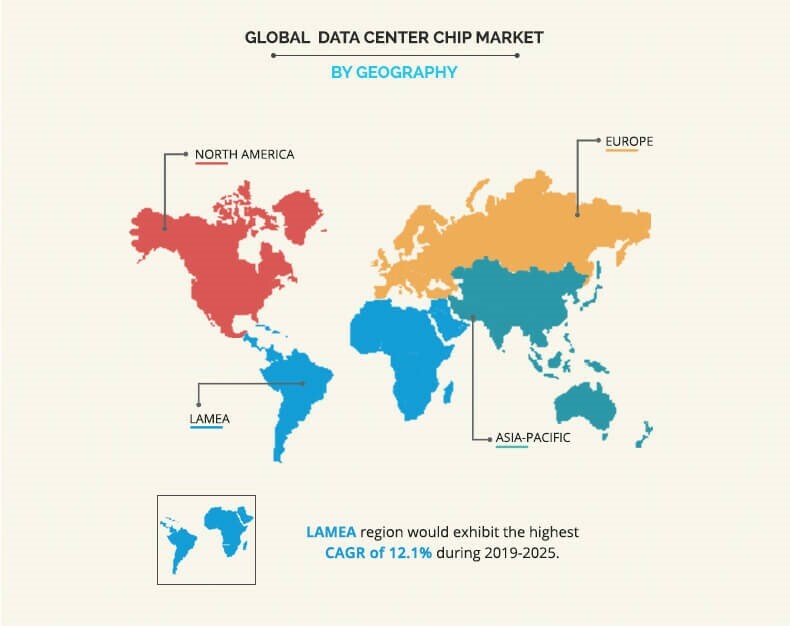 Based on region, the data center chip market trends is analyzed across North America, Europe, Asia-Pacific, and LAMEA, along with their prominent countries. The key trend that is helping the world of data center is the cloud and its connectivity to billions of connected devices such as PCs, autonomous vehicles, virtual reality systems, and others. When smart devices are connected to the cloud, the data generated can be analyzed in real time, enabling these devices to be more useful data center products. The emergence of artificial intelligence, virtual reality systems, and 5G network has given rise to the number of data centers, which in turn is driving the growth of the data center chip market. Technological advancements in memory chip and programmable solutions such as FPGAs, ASICs among others, enhance their performance in connected devices and data centers. For instance, Intels 3D XPoint technology significantly improves access to large amounts of data. Next generation chip such as FPGA and ASIC, can efficiently meet the change in demands for data centers and speed up the performance in other applications. The combination of FPGAs, ASICs with cloud products helps in enhancing the overall performance of data centers. Hence, advancement in technology is driving the global data center chip market. Several countries across the globe have passed data localization laws. This is primarily due to the regulatory and security reasons. Industry verticals, especially BFSI, are stringent regarding hosting its data in a data center out of the country. Therefore, these industries prefer having a local data center. For instance, Oracle, a technology giant in the U.S. proposed to set up a local data center in India for expanding its cloud services. Also, IBM and NTT Communications have two and three data centers respectively in India. Similarly, the Chinese regulatory, Ministry of Industry and Information Technology (MIIT), has also largely favored the issuance of Internet data center (IDC) licenses to local vendors. Furthermore, the Indonesian government Regulation No. 82 mandates Indonesian businesses conducting electronic transactions to store personal data in data centers in the country. Hence, favorable government initiatives to setup local data centers is in turn driving the global data center chip market. Mobile networks are being used to connect all sorts of devices such as automated reading of utility meters, intelligent connectivity of cars, and commercial vehicles to enable drivers to access navigation, infotainment or breakdown services, traffic lights, home security, and assisted living among others. Technological advancements in several mobile computing devices and products, such as smartphones and smart TV, are driving the demand for sophisticated connectivity and enhanced networking solutions. 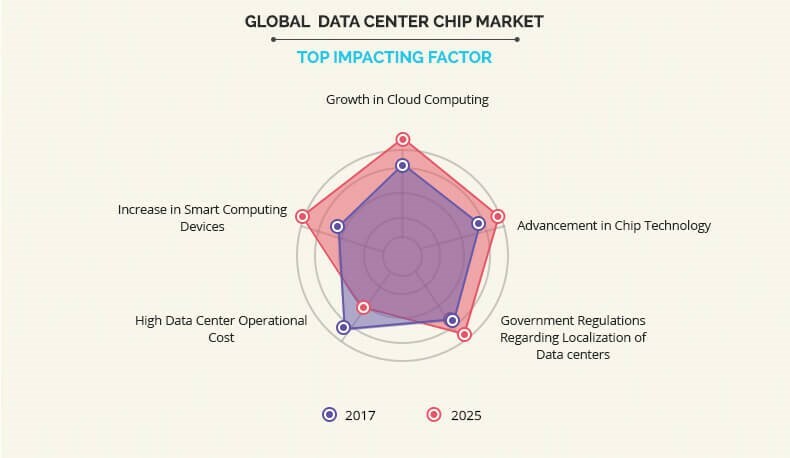 A rise in the adoption of IoT & cloud computing is expected to drive the integration of the chips in the data center servers, which is expected to provide lucrative growth opportunities for the global data center chip market. This study comprises an analytical depiction of the global data center chip market opportunity along with the current trends and future estimations to depict the imminent investment pockets. The overall data center chip market forecast is determined to understand the profitable trends to gain a stronger foothold. The report presents information related to key drivers, restraints, and opportunities with a detailed data center chip market analysis. The data center chip industry is quantitatively analyzed from 2017 to 2025 to benchmark the financial competency. 8.1. ADVANCED MICRO DEVICES, INC.
8.5. HUAWEI TECHNOLOGIES CO., LTD.
8.8. SAMSUNG ELECTRONICS CO. LTD. 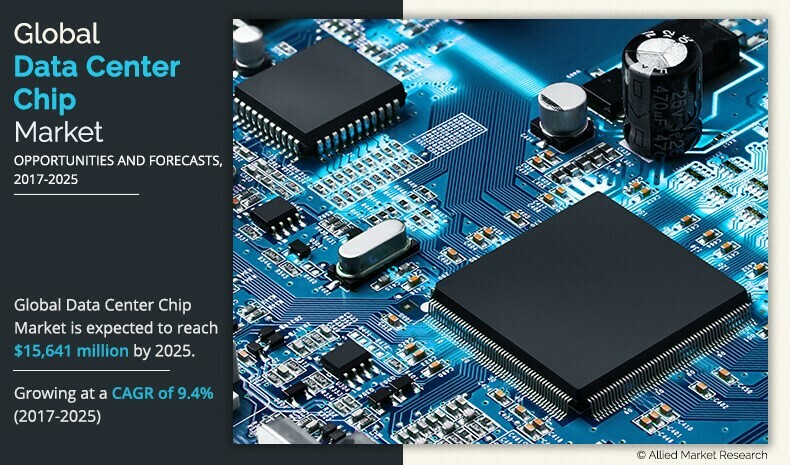 The global data center chip market promises high potential for the semiconductor industry. The business scenario has been witnessing an increase in the demand for data center chips, particularly in the developing regions, such as China, India, and others. 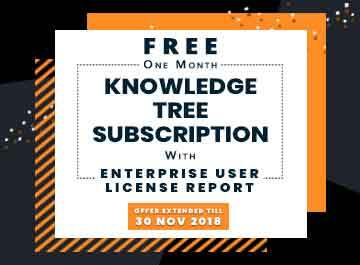 Companies in this industry have been adopting various innovative techniques to provide customers with advanced and new product offerings. Growth in cloud computing, advancements in chip technology, and government regulations regarding localizations of data centers drive the market. However, high data center operational cost impedes this growth. In the near future, increase in smart computing devices is expected to create lucrative opportunities for the key players operating in this market. The global data center chip market was valued at $7,718.9 million in 2017, and is projected to reach $15,641.1 million by 2025, registering a CAGR of 9.4% from 2018 to 2025. North America was the highest contributor to the global market, with $2,933.2 million in 2017, and is estimated to reach $5,474.4 million by 2025, registering a CAGR of 8.3% during the forecast period. The market participants continue to introduce technologically advanced products to remain competitive in the market. Product launch and collaboration are the prominent strategies adopted by the market players. The key players profiled in the report include Intel Corporation, GlobalFoundries, Advanced Micro Devices Inc., Taiwan Semiconductor Manufacturing Co. Ltd., Samsung Electronics Co. Ltd., Arm Limited (SoftBank Group Corp.), Broadcom, Xilinx, Inc., Huawei Technologies Co. Ltd., and Nvidia Corporation.